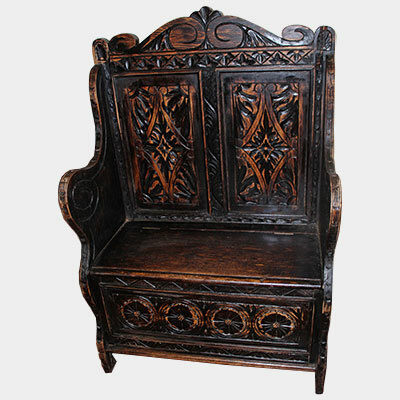 Oak monk's bench with carved panelled. 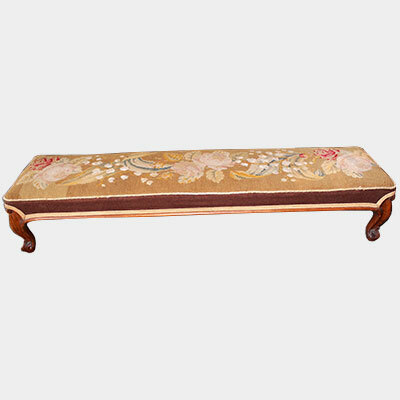 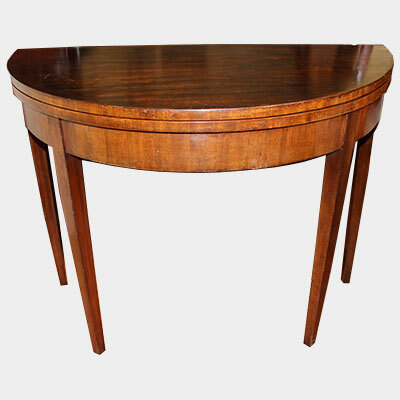 Edwardian mahogany and inlaid display table with tapered legs and under tier. 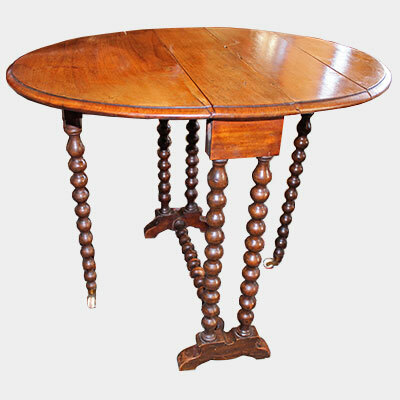 Victorian walnut trumpet shaped work table. 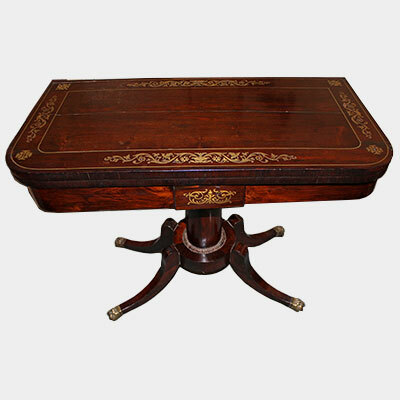 Regency rosewood and brass inlaid card table. 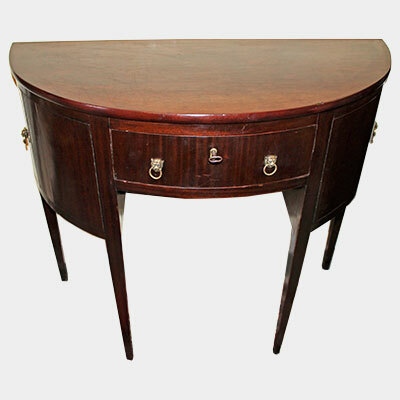 19th century mahogany and inlaid demi lune console table with drawer. 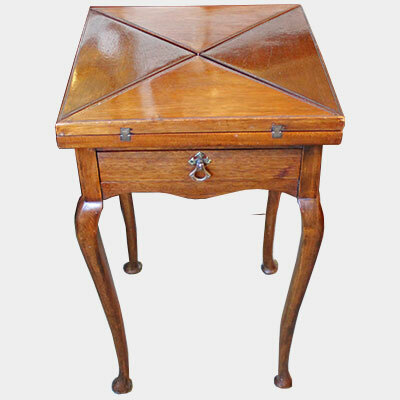 Edwardian mahogany square envelope card table with drawer. 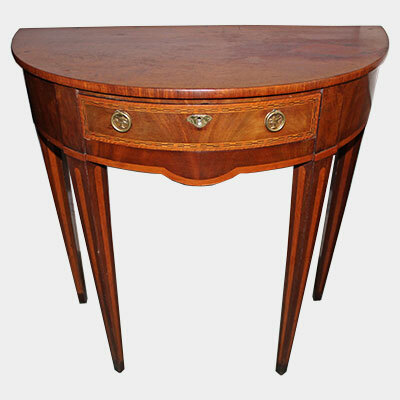 Early 19th century mahogany demi lune table with three drawers and lionhead handles. 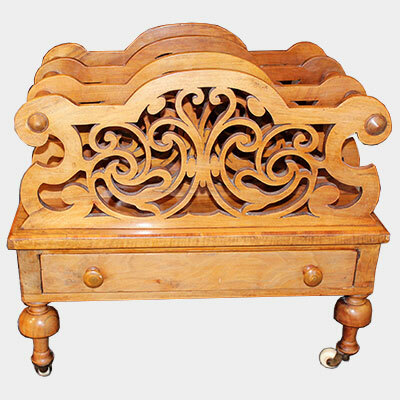 19th century carved oak box seat. 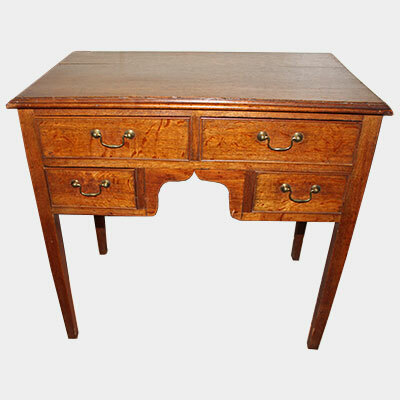 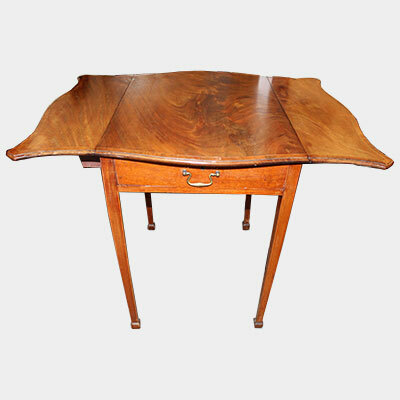 Early 19th century mahogany drop leaf work table. 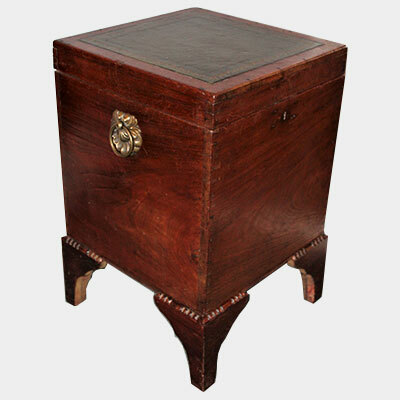 19th century mahogany storage box with leather top. 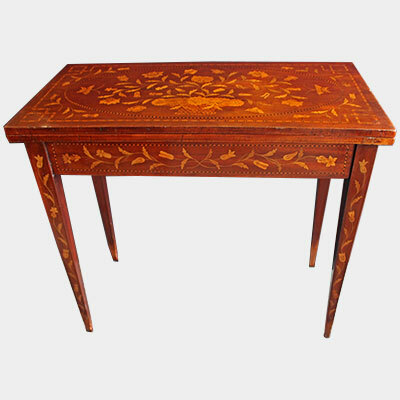 Edwardian mahogany and crossbanded sofa table,inlaid with boxwood. 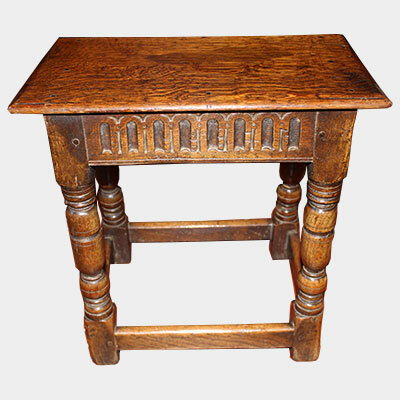 Antique oak joint stool with carved frieze. 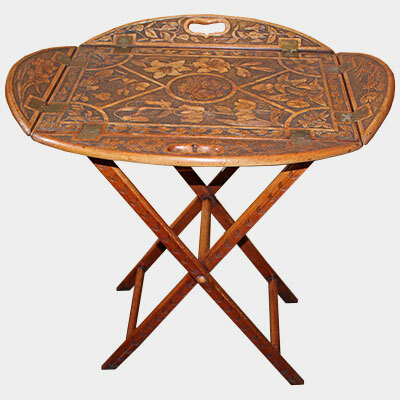 Small 19th century mahogany and satinwood inlaid kidney shaped table. 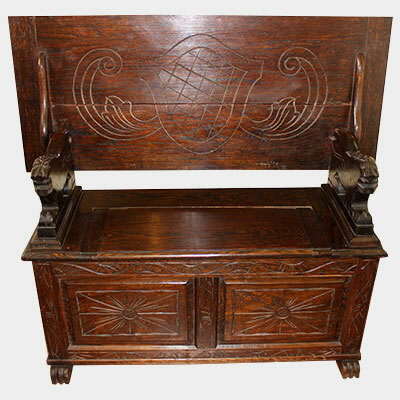 Small early 20th century carved oak monk's bench. 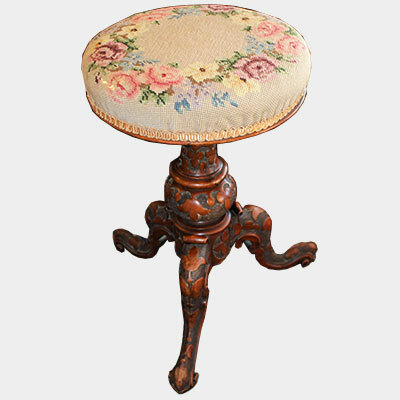 Victorian walnut fender stool with needlework upholstery. 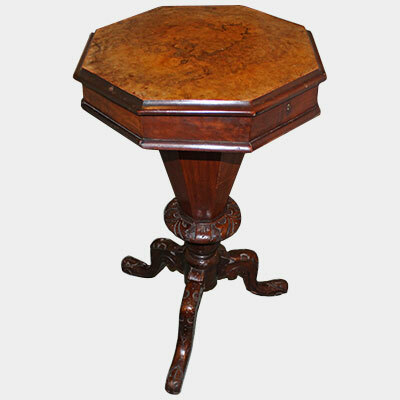 Victorian small oval walnut sutherland table. 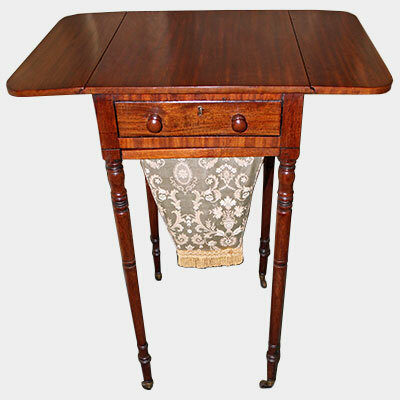 Victorian mahogany piano stool on carved cabriole legs. 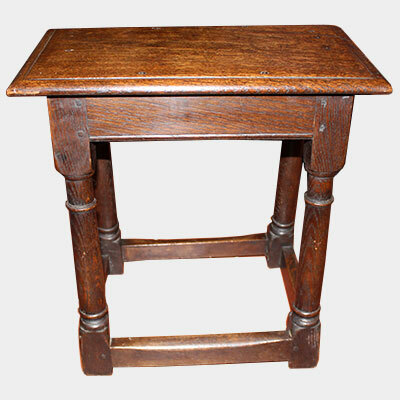 19th century oak joint stool. 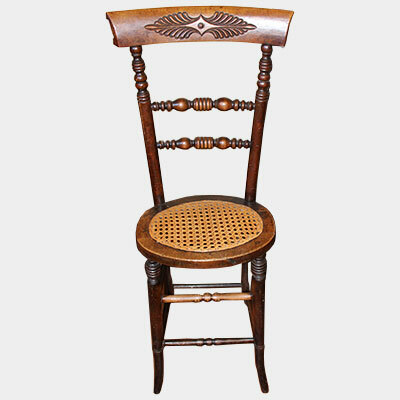 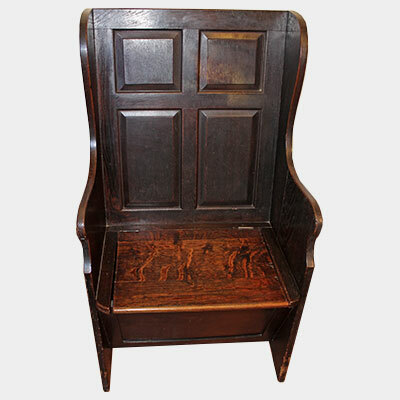 Victorian oak hall seat with panelled back. 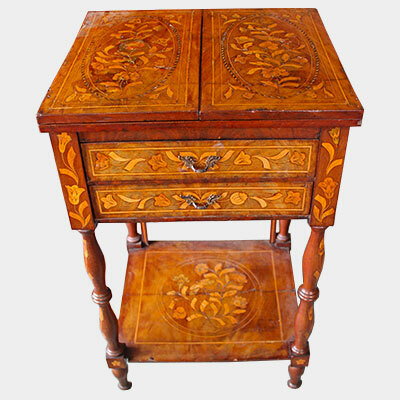 19th century dutch marquetry mahogany and satinwood inlaid dressing table with opening top and shelves that raise up from inside and two drawers to the front. 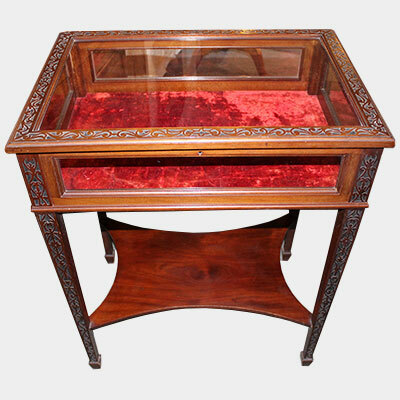 Victorian carved walnut tray on stand. 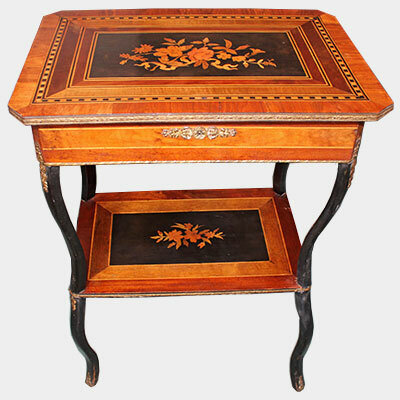 19th century french inlaid mahogany and crossbanded two tier dressing table/vanity box. 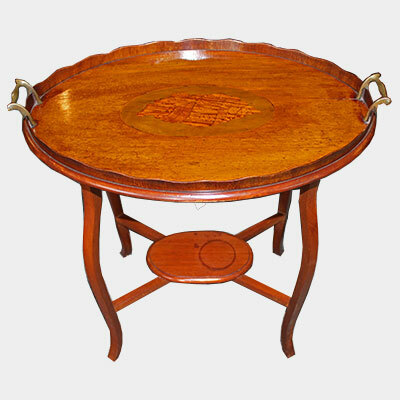 Edwardian oval mahogany and satinwood inlaid tray on later stand. 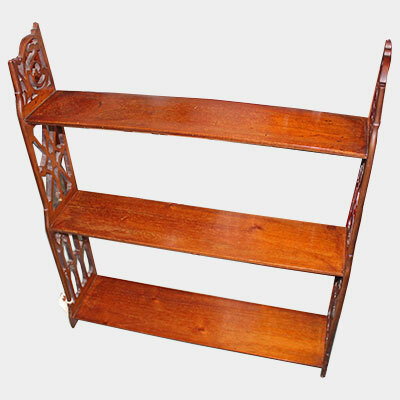 19th century carved mahogany wall shelves. 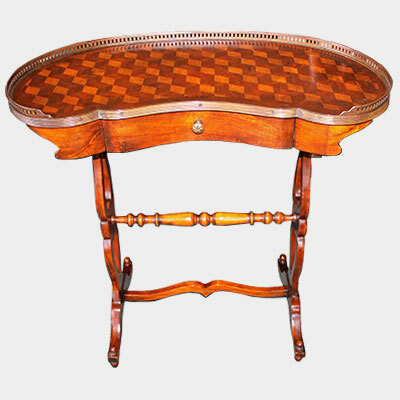 George III mahogany and crossbanded serpentine pembroke table with boxwood line inlay. 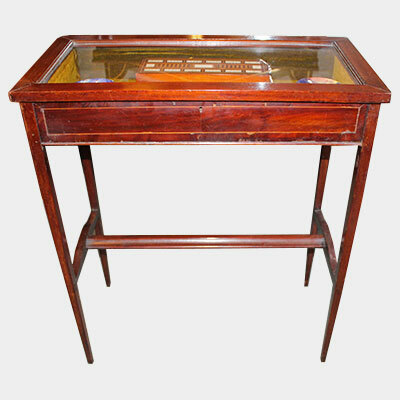 Superb quality early 20th century dutch mahogany and satinwood marquetry games table. 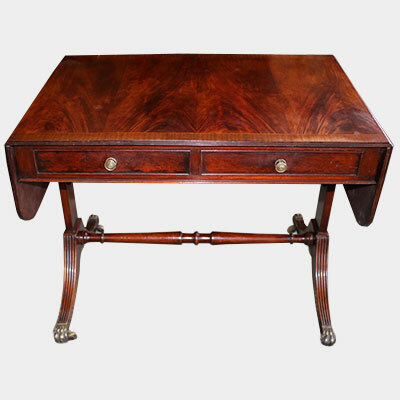 Regency design mahogany demi lune card table. 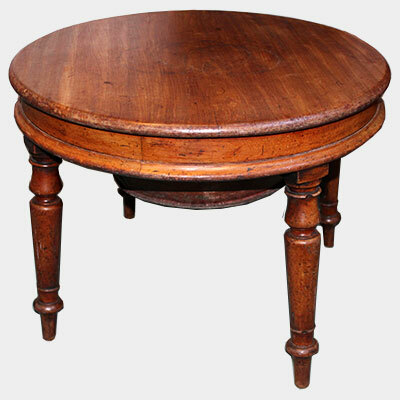 0930h to 1700h Monday to Saturday. 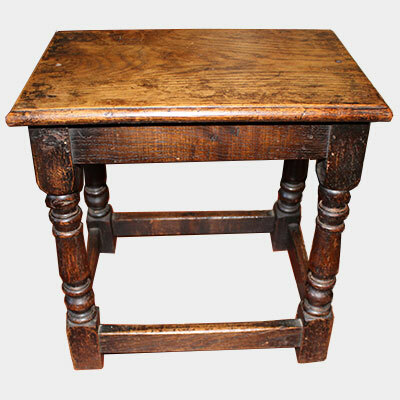 We don't only sell the standard items - we also sell quirky and unusual items: Chaise Longues, monks benches, pedestal desks, extending dining tables, 19th century mahogany bow-front chest of drawers, antique dressing table mirrors, Tripod Tables, Bureaus, Butler's Trays, Campaign Chests, Balloon back chairs, Wing Armchairs, Cricket tables, Jardiniere Stands, Joint Stools, Overmantle Mirrors, Lazy Susan, Sofa Tables, Twin Pillar Dining Tables, Sutherland Tables, Antiques Windsor and Smoker's Bow Armchairs - etc - these are just some of the many items we sell. 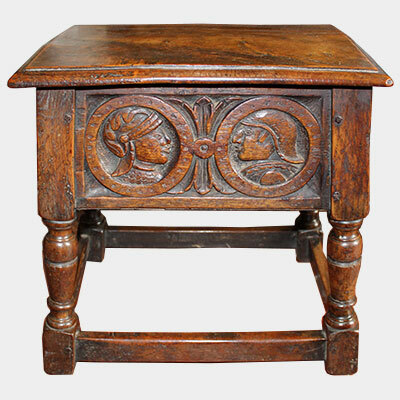 We can help you find that special item you're looking for by contacting us on 01488 682256 or e-mailing us on annabel02@btconnect.com or visiting our shop in Hungerford.